After 4 months of an assiduous effort, “Prabodhan”, a brain child of EPGP class of 2017 manifests an enlightened opening today. The conclave begins with the national anthem and a small ingenious AV about the conception and objective of “Prabodhan”. 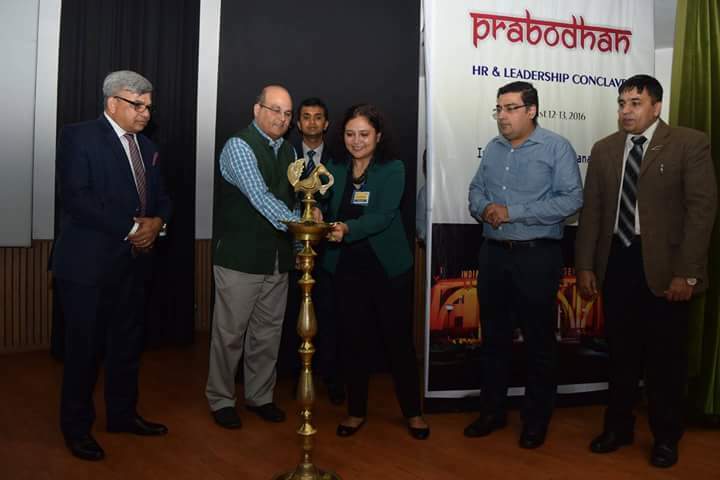 Dr Rishikesha T Krishnan, Director IIM-Indore, Mr Kamal Bali, MD, Volvo India, Mr Asim Rizvi, HR Head, Callidus Cloud, Ms Ruhie Pandey, VP HR, Kaya & Mr Prashant Salwan,EPGP-Chair lightened the ceremonial lamp to officially inaugurate the event. The first day of the conclave was bestowed with the presence of eminent global leaders – Dr Ritu Anand, Deputy Global Head HR, TCS, Mr Sunil Kashikar, VP RMG, Zensar, Mr Arokia Sagayaraj, VP HR, Renault-Nissan, Ms Surabhi Mittal, Head HR, laxness, Mr Arvind Usretay, ED, E&Y, Mr Dhananjay Singh, NHRDN. Dr Rishikesha, while delivering his welcome address, specially lauded EPGP class of 2017 & fellow faculty members for contributing their best to make the event a grand success. He emphasized on the IIM Indore’s methodology of teaching which put considerable efforts in keeping a balance between theory and practice by providing contextually relevant management education and industry interface. The welcome speech was followed by the introductory remarks of Prof Prashant Salwan, EPGP-Chair. Prof Salwan started with a brief overview of EPGP as a program and its uniqueness with respect to other contemporary programs. He emphasized agility and resilience as the prerequisite for the success of any industry and that it is not possible without excellent HR at the helm. The audience was bestowed with the opening remarks of Mr Kamal Bali, MD Volvo India with his views on “Transforming India through people initiatives”. He stated that India has a huge potential but lack of high performance is holding its chariot of growth. He quoted, ”Future is not going to be what it used to be”. He insisted that we are living in VUCA (Volatility, Uncertainty, Complexity & Ambiguity) world and there are 5 mega trends which are going to reshape the future those are Digitization, Economic power-shift from west to east, Economic disparity, Changing relationship between us & our planet and Rapid urbanization. As per his views, increase in Agricultural productivity & Manufacturing activity will progress India towards a better future. Opening remarks from Mr Bali was followed by an insightful round of panel discussion over use of analytics in HR. Mr Rizvi, Ms Ruhie & Mr Mandar provided their insightful views in the Panel discussion which was beautifully moderated by Prof Kamal Jain, IIM Indore. As per the discussion, Analytics has given numbers to the HR function and build a platform for efficient decision making. However, Panelists stressed that the core of HR must not be overlooked. Mr Dhananjay Singh, President, NHRDN thanked EPGP for the organization of the event. He talked about the importance skill development and role of NHRDN in bridging the gap between demand & supply of skilled manpower. Mr Sunil Kashikar, VP RMG, Zensar presented his six point learning on the challenges in recruitment. He also emphasized on Employee value proposition, and said that data driven talent acquisition, positive candidate experience & employer branding are the means to achieve it. Mr Arvind Usretay, ED, E&Y talked about the various ways of disruptions in present work culture. These disruptions are primarily contributed by technology advancement, Globalization & demographic changes. He categorically stated that in future jobs will be lost along with the creation of new jobs and people will have to re-skill to counter the challenge. Mr Arokia Sagayaraj, VP HR, Renault-Nissan, highlighted the changes evident in the automobile sector. He stressed upon the cultural architect concept which binds different people belonging to different locations through a common culture. He said that future prospects of HR will be in processes itself. The day concluded with an excellent speech by Guest of Honor, Dr Ritu Anand, Deputy global Head HR, TCS. She talked about having incremental dreams which are achievable. She said that Talent management is actually a mobility of talent. She also talked about second level of inclusion of women workforce which should happen at the organizational level. She further stated the importance of digitization and talent analytics. Her speech marked the culmination of day 1 of the conclave with great insights of HR & Leadership from the industry leaders.